Blue Sands was a performance by final year LJMU students Ellie Hoskins and Rory Larbelastier and was hosted by performance project A Particular Act. It took place in the residency space at Crown Building Studios, an artist-led gallery and studio on Hannover Street in Liverpool. 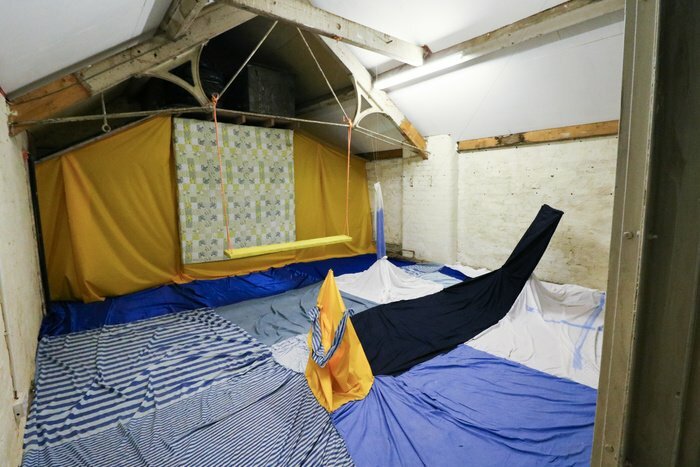 The space, an abandoned loft with high ceilings and old dusty wooden floors, had been transformed by a patchwork fabric covering over the floor, a bright yellow swing suspended from the rafters, and a backdrop of primary yellow fabric and a quaint, faded patchwork bedsheet. From the floor rose fabric tubes, held up by bright thread connecting to the ceiling. As you enter the space you are confronted by the words ‘The Vastness’ on the wall. On the ceiling, the words ‘The Nothingness’ oversee the space. In the background ‘Black Sands’ by Bonobo plays. Underneath the fabric reside the artists. You cannot tell which figure is which artist. Instead you are left only with the movements, with the sense of somebody crawling about underneath the fabric. There were beautiful instances of intimacy where the two artists would come together as one amorphous shape. They would dip in and out of synchronisation. Even when blind to each other they entered the same headspace and become one organism. 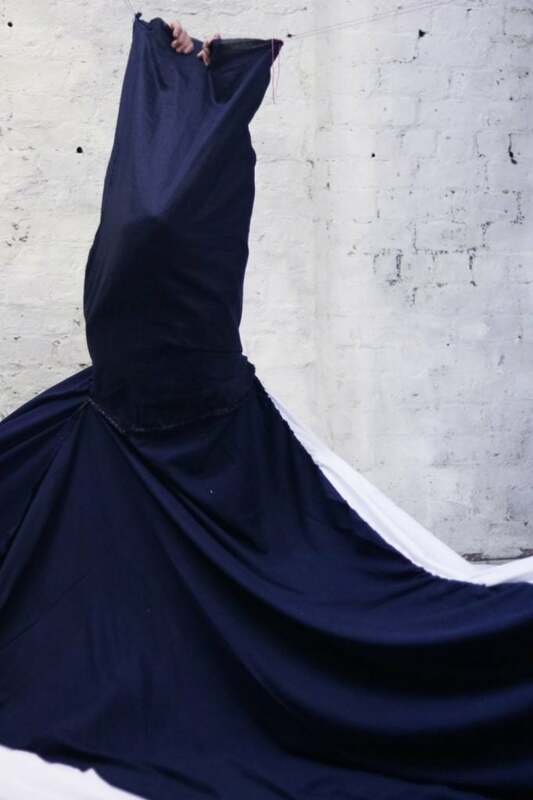 During certain movements, the fabric would extend away from their body and turned the floor into one enormous creature. While not directly ‘participating’, the audience were certainly involved. One beautiful moment occurred where a pair of toes (clad in the feet of a onesie) peeked out from the fabric, wiggling and enticing the nearby viewers. Then they retreated back into the fabric, and the shape began to push the fabric out again to meet the wall. The audience member went to help. She gave the fabric a little tug with her shoe, but the performer snatched the fabric back. These moments, childlike and sincere, interrupt the coldness implied by the words which hang in the space. The words and fabric act in a similar way to Neitzsche’s idea of the mask—in trying to hide this honest, feeling self, the artists reveal their sincere attempts to connect. The performance becomes Sisyphian. The fabric and words are an articulation of existential dread, or perhaps our impotence as the working class to control or effect our own destinies. This horror is relieved through the movements and the performance itself, where intimacy is offered to the audience, not through language or articulation—a intellectual’s remedy—but through the honesty and potency of movement and play. Having known Hoskins and Larbelastier’s practices for some time now, this feels like an excellent articulation of their ideas. This use of the nascent produced a performance that was relatable for everyone. It was a thoughtful outreach from two humans to a room of others. From here I would love to see this work developed. While the integration into the space was excellent, it made the performance part of that building. This work feels much more womb-like, and I would love to be entirely encased in their fabric world. I would also be interested to see a live accompaniment of music. Music which responded to the performers who in turn respond to the music. It would be a beautiful double articulation of the power of non-linguistic communication. 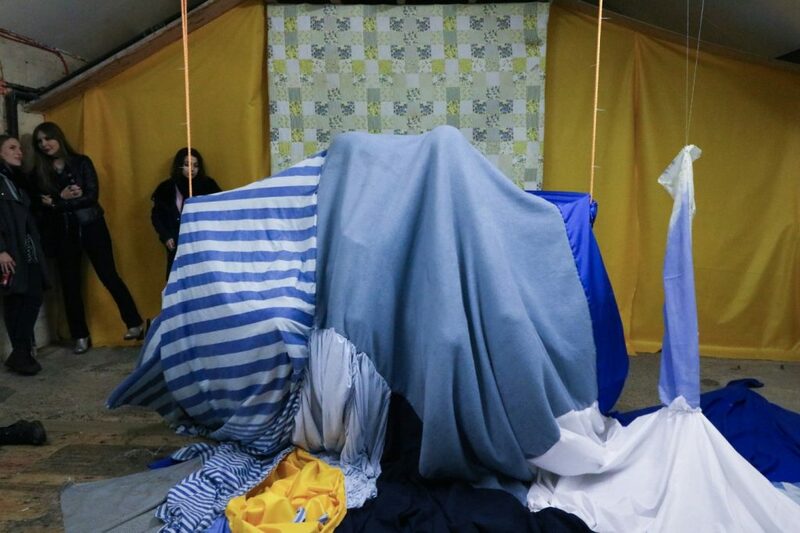 Blue Sands took place thanks to A Particular Act, a performance-based curatorial project by Raphaella Davies and Benjamin Nuttall, as part of the LJMU Polyresidency prize. Their previous events have included work by RCA students, Liverpool Biennial Associate artist Stephen Sheehan, and is a space to watch for 2017. The space, an abandoned loft with high ceilings and old dusty wooden floors, had been transformed by a patchwork fabric covering over the floor, a bright yellow swing suspended from the rafters, and a backdrop of primary yellow fabric and a quaint, faded patchwork bedsheet. Blue Sands took place thanks to A Particular Act, a performance-based curatorial project by Raphaella Davies and Benjamin Nuttall and definitely a space to watch in 2017.